Court No.2 at London's Lambs club is the closest thing to a spiritual home for the game of squash. For decades, its white walls and clear glass back have locked the sport's top players into duels for some of its highest honors; photographs of those big names  from Pakistan's Jahangir Khan to Australia's Geoff Hunt  hang on the wall behind a steep bank of polished, wooden seats. But Lambs is more than a shrine to the game's greats. Hundreds of members  many of whom work in the big banks and law firms that make up the club's neighborhood  rub shoulders with pros on court and in the locker room. "For my teenage years and early twenties, it was the club," says Peter Nicol, 34, a British former world No. 1 who's now coaching at Lambs. "To then play in it every day was something quite special." Sadly, Nicol will not have many more days of playing at Lambs. Despite fierce opposition from members, sports governing bodies and local politicians, the club will close at the end of next month. Mike Corby, Lambs' owner and the man who launched the club in 1979, was forced to sell the site to developers in 2004 to meet bank debts. Work on a nine-story apartment block begins in the fall. The loss of Lambs is a body blow to a sport fighting hard to regain full fitness. Britain has provided six of the world's current top 16 male players  compared with only one of the world's top 50 tennis players  but the game's popularity has stumbled in recent years. As an intense, indoor workout short enough to squeeze into a lunch break, squash stole a march on gyms and fitness centers in Britain during the '70s and '80s. Its premise: Players confined to a 667-square foot court hit a tiny rubber ball against a wall with rackets smaller than those used in tennis. In the capital, the game "was thriving," says Charez Golvala, a corporate lawyer and Lambs member. 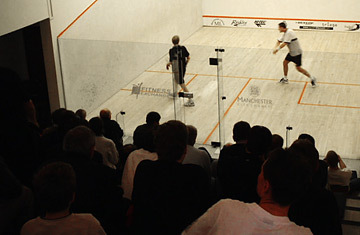 But the growth of alternative pursuits from the late '80s onward  along with a lack of TV coverage that prevented the game's profile from taking off  meant many players nationwide drifted away: 3% of Britons aged 16 or over polled in 1987 had played squash in the previous month, according to Sport England, a government body; by 2002, that figure had slipped to 1%. Over that time, participation in fitness and yoga classes climbed from 9% to 12%. Following the shifts in public preferences in forms of exercise is an essential part of the sports-club business. Two players on a squash court might pay, say, $10 for a 30-minute game, but the same space could hold two floors of spinning or yoga enthusiasts that would generate 30 times the revenue earned from a squash court over the same period. That's a problem facing club owners across the U.K., particularly inner city operators who rely on a lunchtime and after-work rush to meet their higher overheads. Faced with the sky-high rents of central London, some clubs have already shuttered; others have squeezed their number of available courts. Recent efforts to boost squash's public profile have had mixed results. The sport failed to make it onto the Olympic program for the 2012 games in London. (Its advocates hope to make it in 2016.) And though clever technology has made the sport more TV-friendly, with glass courts and white balls making it much easier to follow the action, broadcasts remain hard to find. Still, at its grass roots, the picture is looking brighter. Some 180 years since pupils at England's posh Harrow school invented the game, children are again getting involved. A scheme introduced two years ago by England Squash offers thousands of kids as young as six a taste of the game's cut and thrust, albeit with mini rackets and a bigger, bouncier ball. The more talented among them could yet find themselves playing at a successor club to Lambs. Its members are in talks with authorities on setting up inside exhibition halls a short stroll from the existing club. The new facilities might lack the history of Court No. 2, but, says Nick Rider, CEO of England Squash, "we have to celebrate the contribution of Lambs and get back in the saddle."